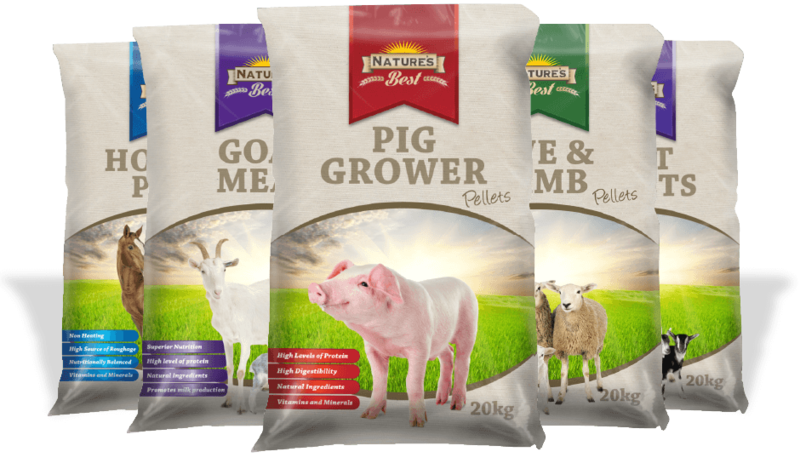 Nature's Best Livestock feed is manufactured in Tasmania under strict quality control, using only the finest local and imported ingredients. All our products are based around growing and maintaining the optimum health of your horse, sheep, pig, goat or cow. Whether you are a large scale industrial farmer, or just need some smaller quantities for your hobby farm, there is definitely something to suit everyone's needs. High level of vitamins and minerals. Nature's Best Pig Grower Pellets have been specially designed and formulated for growing pigs to pork and bacon weights. Pig Grower is a high protein and energy ration with essential vitamins and minerals ideal for optimal and efficient growth of moderately selected pigs throughout the growth phase. High levels of vitamins and minerals. Nature's Best Ewe & Lamb Pellets have been formulated as a high protein, high fibre feed for ewes and lambs of all ages. Nature's Best Ewe & Lamb Pellets contain all essential vitamins and minerals required for maintaining the overall health and vitality of these animals when fed with a good source of roughage (hay or pasture). Helps to promote milk production. Nature's Best Goat Meal is a high protein and energy ration with essential vitamins and minerals to promote optimum growth and health for all breeds of goats. Goat Meal has been nutritionally balanced and formulated for milk production and to meet the vitamin and mineral requirements of healthy, fertile goats. Selected from: Wheat, Barley, Triticale, Lupins, Canola meal, Lucerne meal, Soybean meal, Vegetable oil, Limestone, Di-calcium Phosphate, Salt, Vitamin and mineral premix, Sulphur, Bentonite. Nature's Best Goat Pellets are a high protein and energy ration with essential vitamins and minerals to promote optimum growth and health for all breeds of goats. Goat Pellets have been nutritionally balanced and formulated for milk production and to meet the vitamin and mineral requirements of healthy, fertile goats. Selected from: Barley, Oats, Lupins, Canola meal, Lucerne meal, Soy meal, Maize, Sunflower meal, Vegetable oil, Limestone, Di-calcium Phosphate, Salt, Vitamin and mineral premix. Nature's Best Horse & Pony Pellets are an economical and easy to feed pellet for any breed of horse in light to medium working conditions. Horse & Pony Pellets are a non-heating, supplementary pellet and should be used with the usual roughage sources of hay/chaff or pasture. Horse & Pony Pellets are also a great feed for spelled horses. Nature's Best Mare & Foal Pellets are a palatable and dual purpose pellet feed for broodmares and foals. With 18% protein and essential amino acids, this well-balanced pellet contains increased vitamins and minerals to provide the nutritional requirements for broodmares during reproduction and lactation, and for rapid growth in foals. Nature's Best Mare & Foal Pellets are a supplementary pellet, and should be used with the usual roughage sources of hay, chaff or pasture. Selected from: Wheat, Barley, Triticale, Lupins, Maize, Canola meal, Soya meal, Lucerne meal, Vegetable oil, Limestone, Di-calcium Phosphate, Salt, Magnesium Oxide, Vitamin and mineral premix, Monensin Sodium, Caramel flavouring. Nature's Best Calf Starter Muesli is a nutritionally balanced, high protein calf feed. Nature's Best Calf Starter Muesli is specifically formulated to stimulate efficient feed conversion and includes Monensin Sodium to assist in the prevention of coccidiosis. Nature's Best Calf Starter Muesli encourages rumen development and promotes optimal calf growth in the early stages of life. Selected from: Wheat, Barley, Triticale, Lupins, Maize, Canola meal, Soya meal, Lucerne meal, Vegetable oil, Limestone, Di-calcium Phosphate, Salt, Magnesium Oxide, Vitamin and mineral premix, Monensin Sodium, Carmael flavouring. Nature's Best Calf Grower Muesli is a highly palatable and nutritionally balanced calf feed. Specifically formulated to stimulate efficient feed conversion and incorporating Monensin Sodium to assist in the prevention of coccidiosis. Nature's Best Calf Grower Muesli encourages rumen development resulting in improved body condition during this essential growth stage. Nature's Best Calf Grower Pellets are a highly palatable and nutritionally balanced calf feed. Specifically formulated to stimulate efficient feed conversion and incorporating Monensin Sodium to assist in the prevention of coccidiosis. Nature's Best Calf Grower Pellets encourage rumen development resulting in improved body condition during this essential growth stage.